← We are Addicted to the Iditarod! Today I wanted to share with you some of the Iditarod books we have been reading over the last three weeks. We have learned so much about the race from each and everyone. These stories are filled with so much heart and courage and the illustrations and photos are wonderful. We have loved these stories and loved cheering on the characters as they race to greatness. You might even find yourself a bit teary at the end. This book has been on our windowsill all race. This is a photo book of each of the checkpoints. I love being able to see what each checkpoint looks like and learn a little about each one. Many of the checkpoints are just that checkpoints but some are small towns with one or two hundred people. It has been so nice to have a visual during the race! This book was written by Libby Riddles herself and it tells of her race as the first woman to win the Iditarod. It is an amazing tale of bravery, risk and heart. This very new book is about some of the famous dogs who run the race and many of the current Mushers are featured. 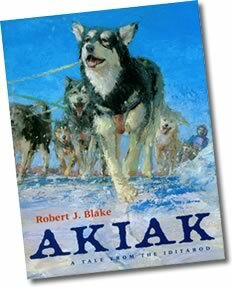 This beautiful tale is about a dog named Akiak and her quest to finally win the Iditarod. Robert J. Blake’s paintings in the book are incredible. This book has been one of our favorites! This was the first book that brought the Iditarod craze into our home two months ago. We have recently checked it out from the library again because we loved it so much. It is a wonderful and simple introduction to the Iditarod for children. The illustrations are great and the information is presented in a simple and entertaining manner. This is the story about the original “Iditarod Race” in 1925 to bring medication from Anchorage to Nome to save the 1400 people who were sick with diptheria. Twenty teams braved the trail and this heroic story is about Togo the dog and his team. This story of the Iditarod is told through the dog’s point of view. It is a great story with lots of good information about the race. I also love the glossary at the back of the book with all of the unique words used in the Iditarod.